A bronze horse bit in the Burrell Collection, Scotland (photographed by your humble correspondent). Note that there is no gap or join in the rings which link the left and right cheeks; the caster poured one side then made the mould for the other around it. They date it to the fourth century BCE and place it in Etruria. 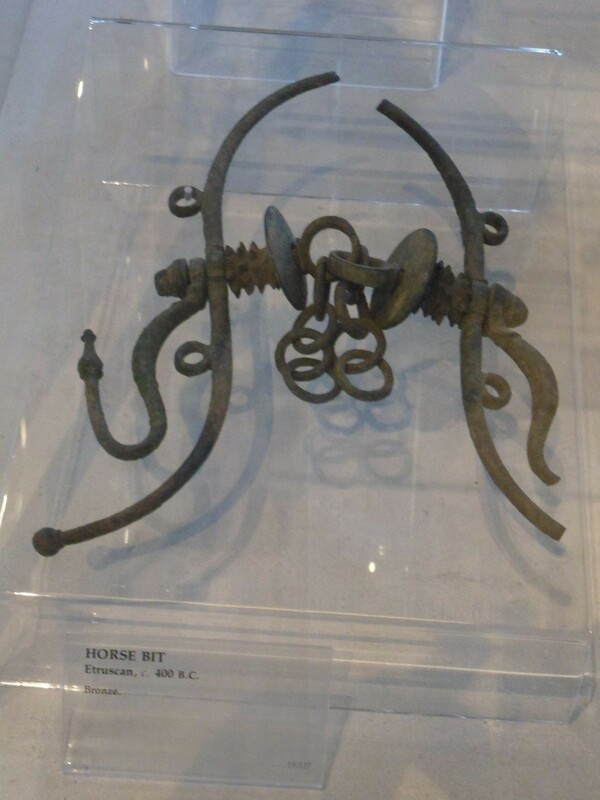 Does that make it an Etruscan horse bit? A recent post at Bones Don’t Lie inspired me to pull this out of my file of prepared posts. I promise my patient readers that my next post will have both books and swords in it. Like Herodotus and Hellanicus, Thucydides also specified certain intervals of years from the Fall of Troy (eg. for the Return of the Heraclids) and others from his own time (eg. Corinthian naval activity). To this day, numerical expressions such as these condition the chronology, yet historians are skeptical when Thucydides demonstrates the great antiquity of an erstwhile Delian festival from the fact that it is mentioned in Homer’s Hymn to Apollo, and reject his testimony that the grave goods from the opened Delian tombs were Carian, because the tombs, when excavated, yielded Geometric pottery. The manufacture of such pottery is attributed to Hellenes, presumably because it is found in what became known, at some indeterminate moment, as Hellas, but in fact there is nothing about the pottery that proves the hypothesis of Hellenic manufacture. A remark from R.M. Cook shows how the hypothesis has taken precedence over the testimony: “Thucydides, or an informant who he considered reliable, did not recognize Geometric (or perhaps Orientalizing) pottery as being particularly Greek, and dated it at least 300 years too early.” It is we who have assumed that Geometric pottery was made only by Hellenes; perhaps Thucydides’ remark should cause us to re-examine that assumption. I certainly can’t speak to pottery typologies, but I can say that ethnic terms are always tricky, and that people have a curious tendency to repeat numbers once they have heard them.